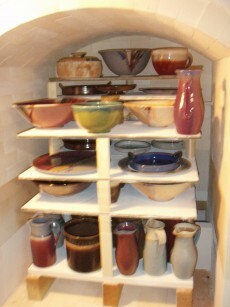 Oak Hill Studio is a working pottery in Meredith, NH. The clays are from the local pits in Sheffield, MA., where clay has been mined and processed for generations. I form the clay and fire the wares in a high temperature reduction atmosphere, just as potters have done for thousands of years. I make both porcelain and stoneware. The forms are an attempt to marry function and beauty. This stoneware is not to be confused with low fire earthenware and faience pottery which, although lovely is very fragile. 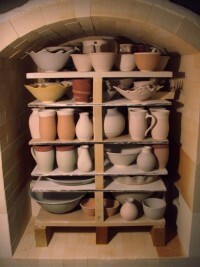 Pottery from Oak Hill is dishwasher safe and oven proof. It should last for years. Hot pots, fresh out of the kiln!